I am writing to thank you for making me feel so welcome when I visited your wonderful nursery this morning. As soon as I entered your building I was taken with how well the children were sitting and enjoying their reading time together. What a joy it is to see such amazing learning experiences as well as young children who are happy to talk about their time with you and sit so well, listening to each other’s views and taking turns. I was so impressed when I went around the different learning spaces and by your close attention to providing such diverse and carefully planned provision. At Orston Primary we have a real focus on nurturing all aspects of a child’s development and I now understand why children from your nursery transfer so well to us at FS2. Can I also add that I was thrilled to be invited to see the Forest School, as outdoor education is a real interest of mine. What a fantastic experience for your children, there is a lot to be said for children being free to explore and challenge themselves in a safe and open environment like yours.I know research has shown that most adults would say that their happiest childhood memories are linked to adventures in the out of doors. Your children get to have adventures every day! Thank you again for inviting me to have a tour. 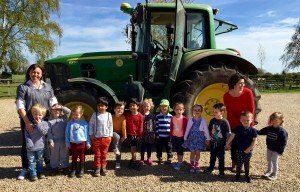 “We are always delighted to receive children from the Nursery every year and we know that the children have all had a wonderful preparation for school life. Robert is always welcoming and approachable and shows great interest in our school and how his past pupils are getting on. He welcomes our Foundation Stage Leader to his school each year to ensure smooth transitions for each child. 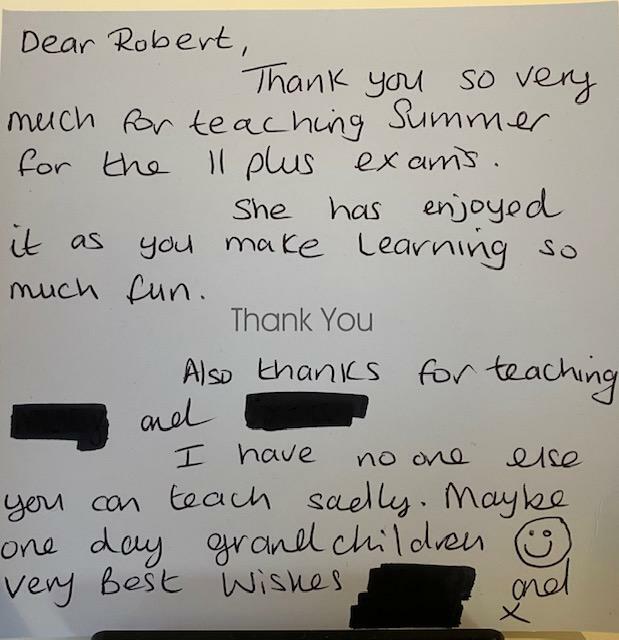 Robert tutors a number of our children to help prepare them for their 11+ entrance exams and I know our children enjoy going to him. They have great confidence in him and like him very much. Staunton Montessori is a nurturing environment for children and everyone speaks very highly of the organisation. 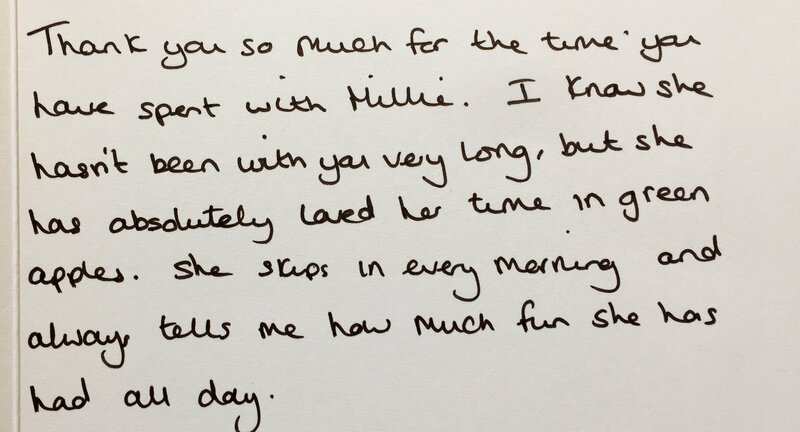 “Thank you once again for looking after my daughter with such genuine kindness, care and a sense of fun this term. She absolutely loves nursery and is obviously thriving in the Staunton Montessori environment. When I get home from a busy day at work she is always full off the excitement of her day at nursery and the happy times she has had with you, which is just such a pleasure to hear.” – Comments from Dr S. a local GP. Just wanted to thank you and Adie for providing such a wonderful nursery, we really do appreciate everything you have done for the boys. The boys have gained so much attending your school and as parents we have been extremely comfortable leaving them in your care. Thank you for providing such a wonderful caring and learning and fun environment for the boys to grow and develop. You have an amazing team and please pass on our thanks to all of them, the boys keep saying we will miss the teachers and so will I! A fantastic nursery school. My daughter loves coming – everybody at the school is so friendly and all the children always look so happy. Well done! This is a great school. Facilities are very good and all the children appear to be thriving – what more can you ask for? Well done! Very pleased with the quality of care, environment and stimulation and most of all, our son is settled and happy and loves coming. I have been astonished at how much my daughter loves coming to school and the progress she has made since she started. I would not hesitate to recommend Staunton Montessori to anyone looking for a pre-school nursery for their child. I am extremely happy with all aspects of the nursery… I’ve no complaints whatsoever. Thank you. Extremely happy with the standard of childcare you provide – a very joyful environment for young children to thrive in. I wish I was three years old again! I always feel you are totally approachable and you make time to address any questions/comments. You really know my daughter. 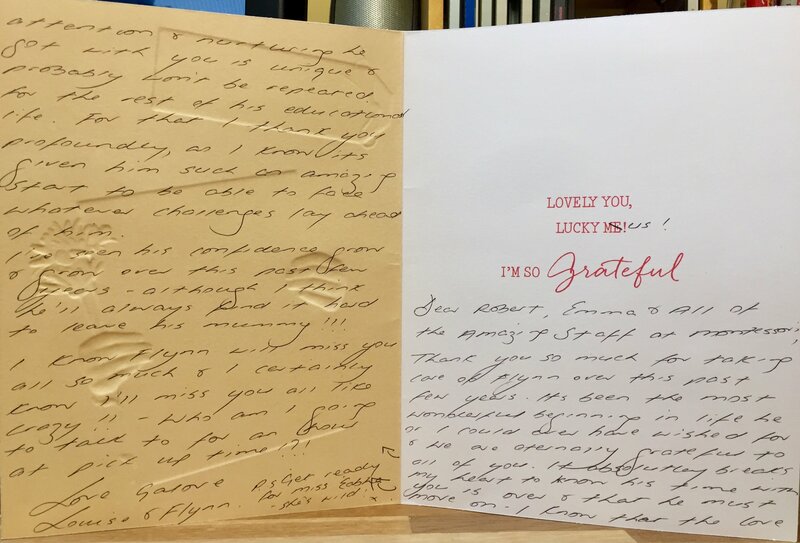 Expressions of Appreciation from Parents & Children…. 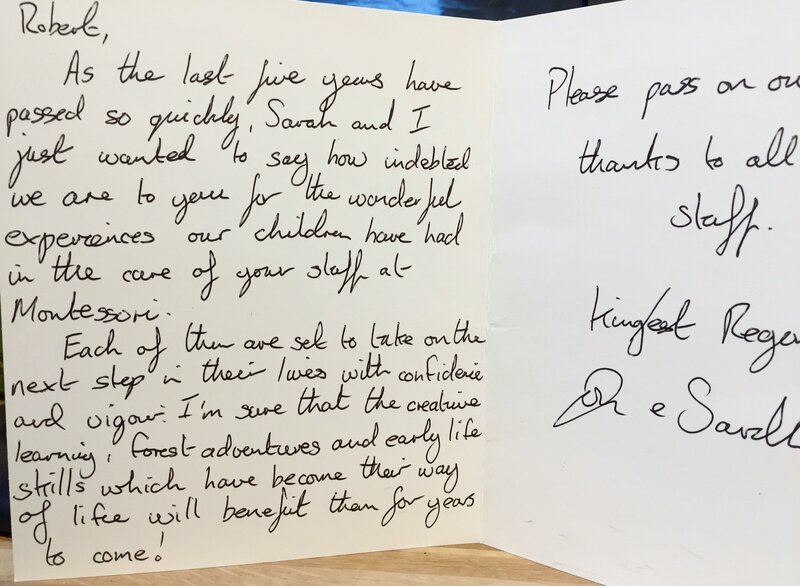 “Hello Robert, We have been meaning to write this letter for some time but now with our son’s leaving date upon us we feel that this is the right time to share our thoughts and feelings with you.We can’t praise you all highly enough for the work and care you show our children. From the moment we introduced our son to Montessori it’s been a transformation.Following a bad and rather stressful experience at another nursery both my wife and myself had reservations about trying somewhere new. How glad we are though that you and your team made us comfortable and confident enough to try again.What you’ve helped with and encouraged our son (and our younger son more recently) to achieve and become is amazing. 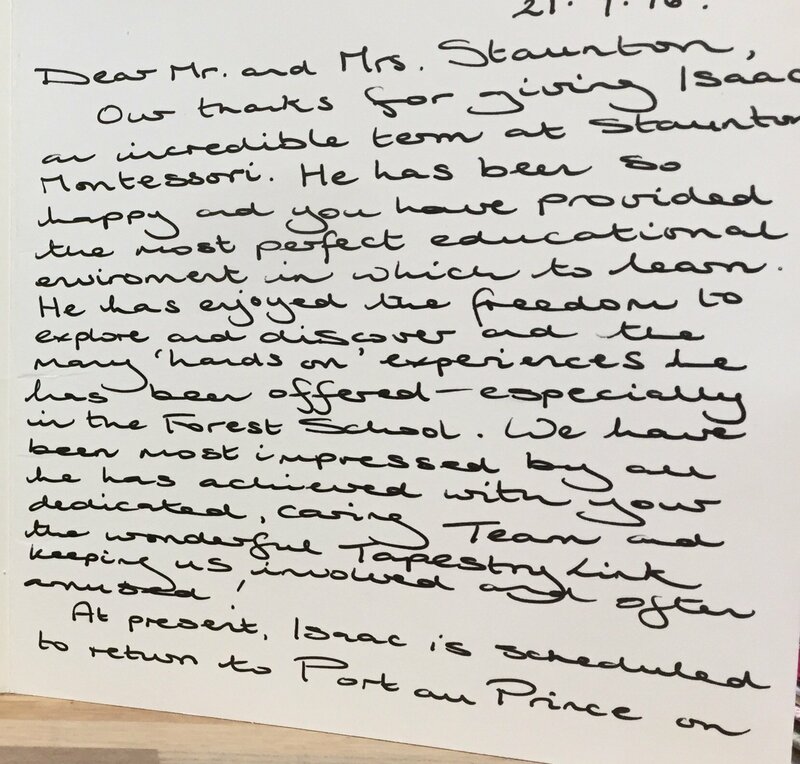 As with most parents there have been ups and downs a plenty but we’ve always been met and dealt with by happy, attentive and enthusiastic teachers. 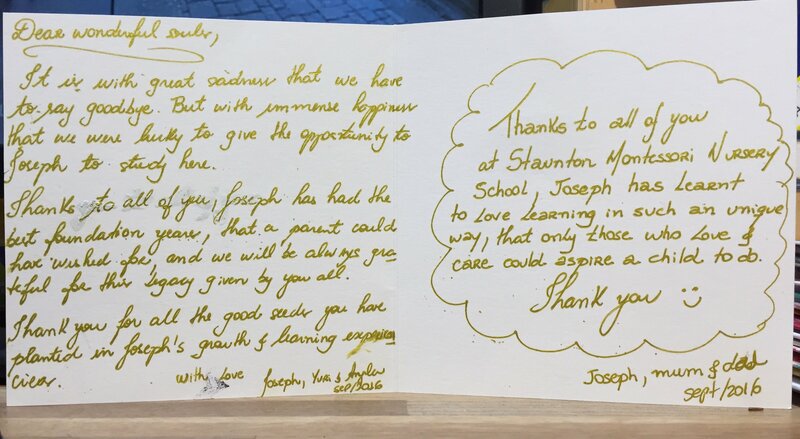 To All at Staunton Montessori, from Charlotte and Jon-Paul D.
“We just wanted to say a big thank you to all the staff for taking such good care of Poppy over the last 2 years. It has been a truly wonderful time that Poppy has had at Montessori and we have seen her development race ahead whilst being in the Montessori learning environment. We have been very impressed with the education Poppy has received at Montessori and feel very confident that she will be leaving you more than well equipped to start the next chapter of her education. We have also been impressed, and truly grateful, with the philosophy employed at the school that embraces the family into the learning experience. This has meant that we were able to reinforce what Poppy learnt at school at home but also be able to engage with Poppy about school and talk about her day. If you had not kept us so well informed at all times throughout Poppy’s time at the school, all we ever would have learnt from Poppy when we asked her what had she done that day was “all sorts”. 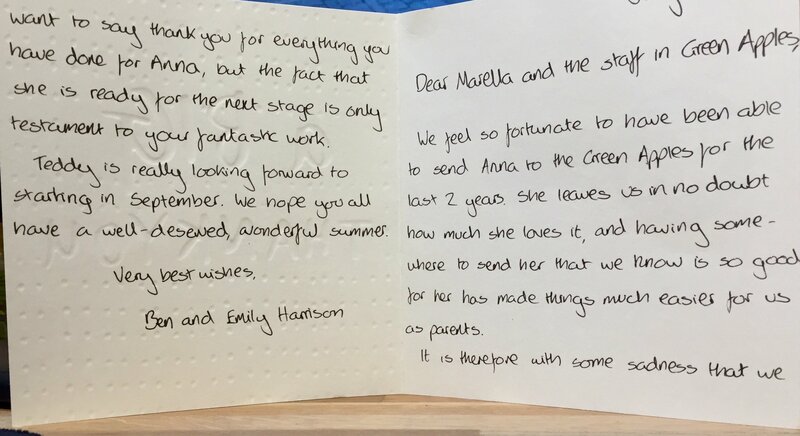 However, the communication from the school and availability and openness of the staff has meant that the combination of a great school and a caring family produces ‘great students’. We truly believe in the philosophies Montessori embodies and think that Staunton Montessori delivers this excellently. 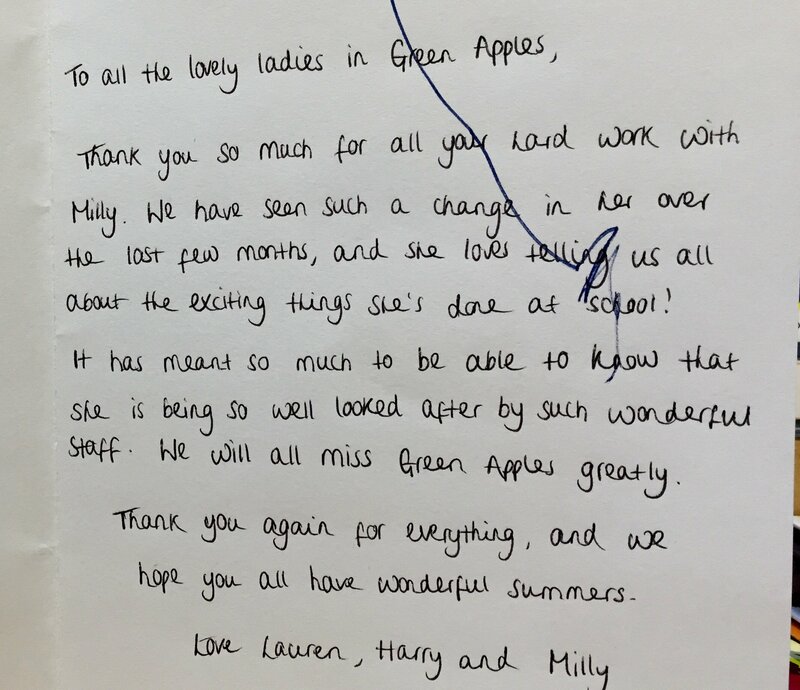 We hope the staff will know that the school will always remain dear to our hearts and we will always have a commitment to the school and would love to support it to grow and continue to develop anyway we can. So once again thank you so much to everyone at Staunton Montessori and we shall miss you. “My daughter absolutely loves Staunton Montessori School. It shows because she is bright, happy and sings all the time! I know she loves it, as each morning she attends, she is very enthusiastic about going. I would always recommend this Montessori School at Staunton.” Sarah G.
“Adrienne & Robert provided a warm, friendly and welcoming environment where learning is enjoyable and fun. Sophie is always welcomed and put immediately at ease – she is always eager to enter the classroom and start her day. Sophie’s continuing development is wonderful to see. She takes great pride in the work she brings home and has enjoyed all the projects undertaken. We would have no hesitation in recommending the school to any parent.” Sue M.
“Often our daughter wakes up and asks excitedly, ‘Is it school today?’ She just loves Adrienne, Robert and Staunton Montessori School.” Kay M.
“This is our son’s first experience of Nursery School and he has settled in really well. 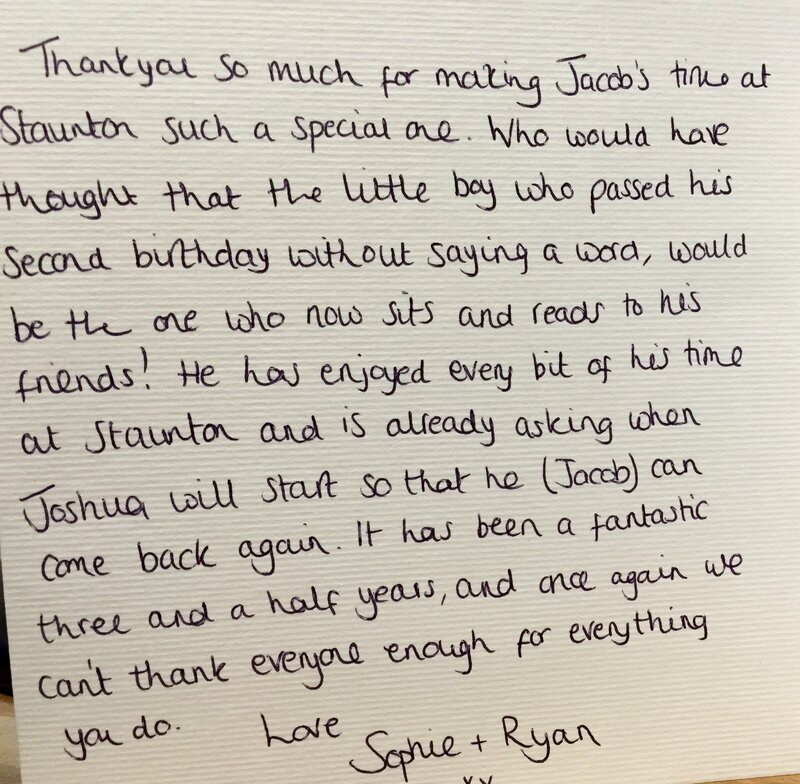 Robert and Adrienne make him feel so welcome and seem to be able to tailor their programme to suit each child’s individual needs. 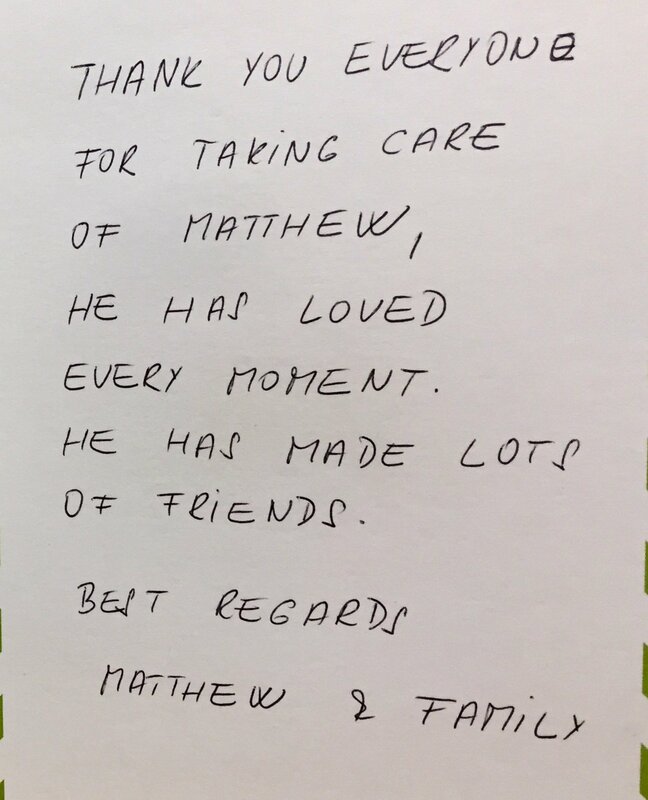 This is particularly so with our son, who has Special Needs and their care and dedication to cater and adapt to his needs is very much appreciated by us (his parents) and by our son. This is evident in the way that he responds to Robert and Adrienne. The end of year report and feedback session was very useful and informative, and their assessment of our son’s abilities and his needs were interesting and insightful. 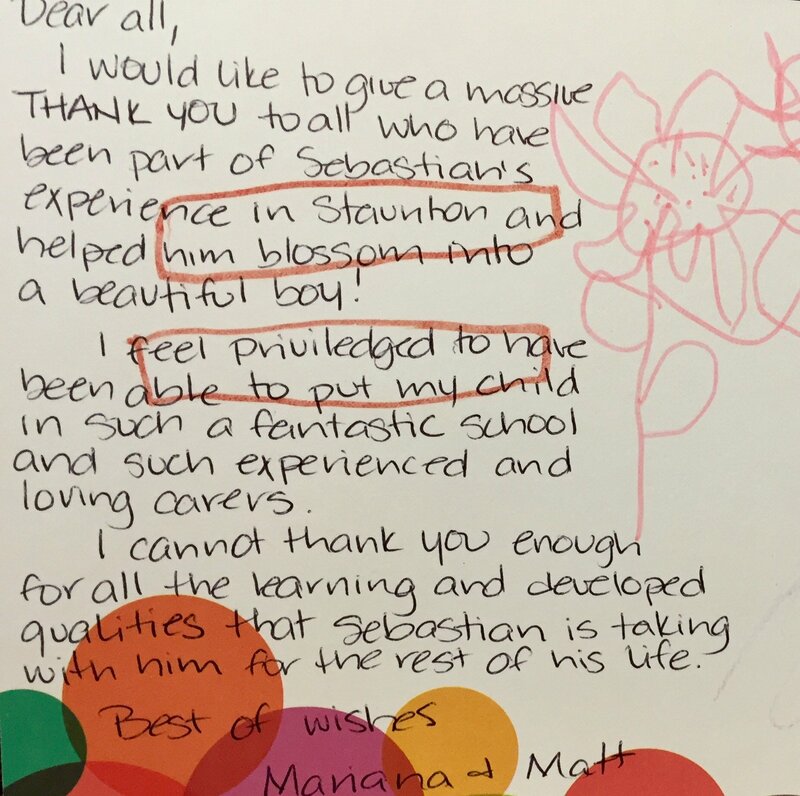 Keep up the great work!” Patrick N.
“We are so glad we discovered Staunton Montessori School, for our son aged three years. It’s happy atmosphere, bright and cheerful surroundings and fun approach to learning have enhanced our son’s development enormously.” Jackie S.